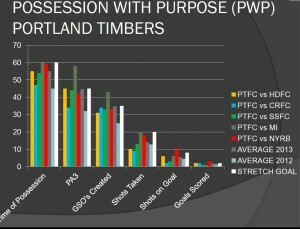 Houston didn’t really behave like a possession based team to date and they still haven’t; Portland dominated possession this game. Houston were pretty efficient in taking shots this year but with two players missing (Bruin and Garcia) – plus a redefined Portland defense – their shots taken and shots on goal dropped dramatically from previous games and was even lower than their output against FC Dallas. 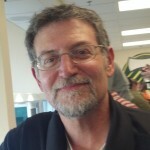 Barnes and Bruin were their primary shot takers; Moffat led the team with 2 while they were shutout. Their attack appeared balanced in OPTA but was very one-sided this game; more later on that. 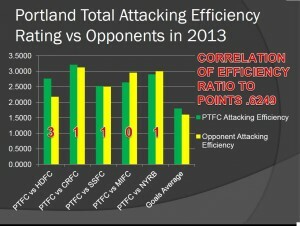 PTFC had a 2 goals against average this season after four games while Houston had a 2 goals for average this season; irony of ironies PTFC score 2 goals and Houston gets shut out! Ricketts was again Mister Fanstistic; he didn’t have to stretch out 150% on any saves this game but the two shots on goal were duly saved as appropriate; his first piece of lumber this year! In the words of Gomer Pyle USMC – ‘surprise, surprise, surprise’. And go figure – the primary target area for creating goal scoring opportunities was the right part of our 18 yard box; to be precise (based upon the data I collected this game) a full 75% of all penetrations down our left ended up being delivered to our right part of the 18 yard box. While I’m not saying this is 100% accurate it does provide me enough compelling information to understand why David Horst (the taller of our center-backs) was positioned as a right center-back as opposed to Silvestre. That height advantage helps generate more clearances on crosses coming in from the left. 8 Crosses (5 unsuccessful – 3 successful) came in from our left to our right… 6 crosses (4 unsuccessful and 2 successful) came in from our right to our left. 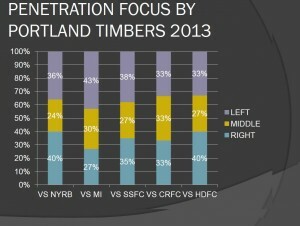 Balance remains the word of the day for Portland and their own penetrations…. here’s the data for your consideration. Just not a lot of difference over the last five games; consistency of purpose in variation (in the military we call it “rigid flexibility” makes this team harder and harder to defend against. So what about the targeted areas this game? Oddly enough 38% of the targeted areas for creating goal scoring opportunities were the right side of the Houston 18 yard box; 38% were directed towards the left side of the 18 yard box and 24% of them targeted the middle part of the 18 yard box… - rigid flexibility anyone? Variation in targeting also makes it difficult to defend against Portland; as a reminder Goal 1 came from a cross down our right; their left and Goal 2 came from a penetration down the middle to their right. 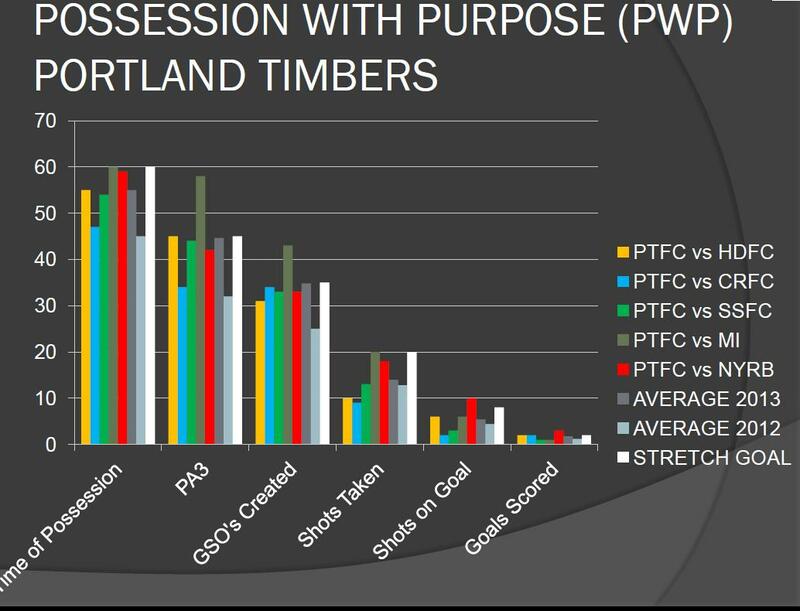 How about the overall picture on Possession with Purpose and the trends since day 1? For the curvelinear types it continues to appear that there remains a relationship with these six data points; and while this only represents 5 games (I really need 22 of them) the correlation between this data and points in the table stands at .6249. Data analysis guys will say that the closer that number is to “1″ the better; the further away from “1″ the less correlation. Well if you are a betting kind of person and you can plot trends like this over the course of 30 games or more there is a good chance that the team who has higher efficiency ratios with these numbers is more likely to win… the challenge comes in having enough data to separate home versus away games. 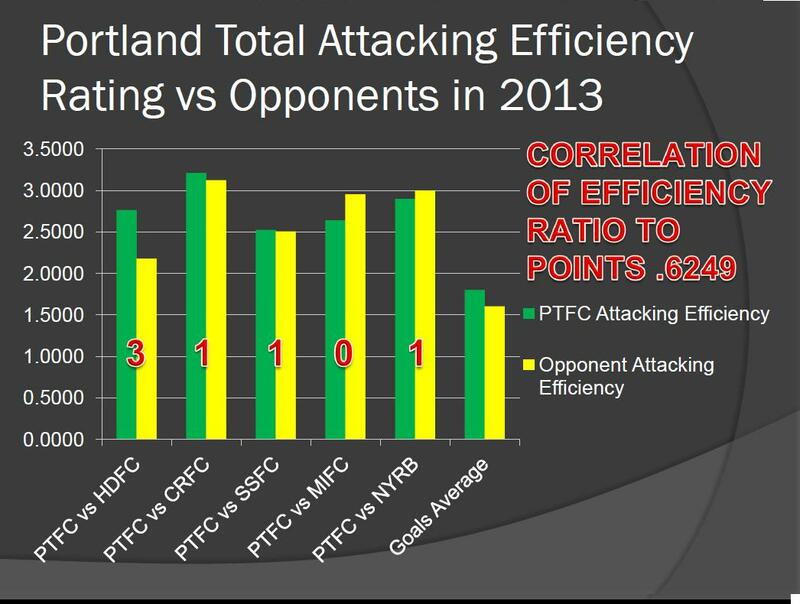 From an attacking standpoint Houston penetrated more than New York or Montreal, they created more GSO’s but ended up with fewer shots taken, fewer shots on goal and nil-pwa – so while the results indicate three points for Portland the data validates how comprehensive the defense was in shutting down Houston in the critical areas of attack. In considering this information and other data out there it seems reasonable that this latest installment on who plays where is getting better and more refined as the season unfolds. Many might disagree with the initial offering to have Rodney Wallace on the pitch; I don’t. Ryan Johnson, along with his teammates, provided the firepower for Portland on Saturday – rightly so Ryan was awarded MLS player of the Week. Courtesy of MLSsoccer.com His second goal… this more of a counterattack with some quick and nifty passing… as duly noted in my match report. No real point in offering up Player Evaluations… bottom line here is Ryan Johnson gets an “A” and with such a comprehensive win it’s hard for me to offer up anything but a “B” for anyone else… pure team play, great leadership, and one Yellow Card against Silvestre that even left the MLS Assessor shrugging his shoulders.